Although many gardens are ‘put to bed’ over the winter there is of course plenty to be done with preparing beds for spring planting. 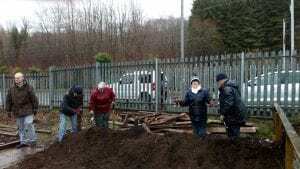 Part of the Rewilding project has focussed on connecting participating volunteers to their local green spaces and this includes local food growing spaces. Parklea is based in Port Glasgow and is on the former council site used for growing bedding plants. The glass houses are massive and are still useable for propagation and growing. Parklea Association Branching Out Ltd (with charitable status) was established in 1997 and now uses horticulture as a vehicle to provide a variety of different training, work experience, supported employment, recreational and social facilities for a variety of clients including adults and children with learning and/or physical disabilities, those with mental health problems, school leavers, young and long term unemployed, elderly groups and community groups. Parklea also provide training to SVQ level in horticulture and employability programmes. It is a fantastic set-up with a thriving plant sales and café which are well-used by a variety of user groups. They are redeveloping their allotment space and tasked us with moving all the old strawberry, blackcurrant and raspberry plants while the design is completely overhauled. We worked through the drizzle and were rewarded with a very tasty up of soup from the cafe while drying off in their meeting room. You can currently pop in to buy a Christmas wreath knowing your money is going towards a brilliant project!